Google's Picasa service is a great photo storage service. Once installed on your computer it can quickly scan through your hard drive and index all of your photos, and make them available for sharing on the web. It also comes with a simple photo effect editor. If you do choose to use Picasa to share your photos online, be sure to add a watermark to them first. Photos online are easily re-shared and re-appropriated, which can quickly lead to you losing credit for your work. 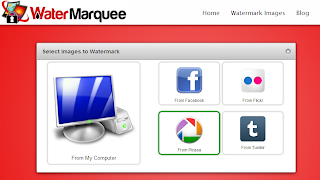 Luckily, Water Marque Pro makes it easy to add watermarks to your Picasa photos. Before you can grab images from Picasa, you'll need to integrate it with your Water Marquee Pro account. To do that, go to your Account page, and click on the Picasa icon under Integration Options. 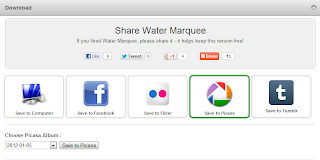 Select the Picasa icon to integrate it with your Water Marquee Pro account. If you have a pop-up blocker turned on, make sure you set it to allow Water Marquee to open a pop-up. Make sure your pop-up blocker lets Water Marquee bring up a new window. A new window will open that looks like the one shown below. This window will let you authorize Water Marquee to access your Picasa images. If you have more than one Google account, select the account name you want to integrate with Water Marquee and click Continue. On the next screen, click the Allow Access button. click Continue, and then Allow Access. After your account is integrated you'll be able to watermark images already stored in your Picasa account. When you go to the Watermark Images page you'll automatically be shown the Select Images to Watermark dialog. Select the Picasa icon. Select the Picasa icon from the Select Images to Watermark dialog. 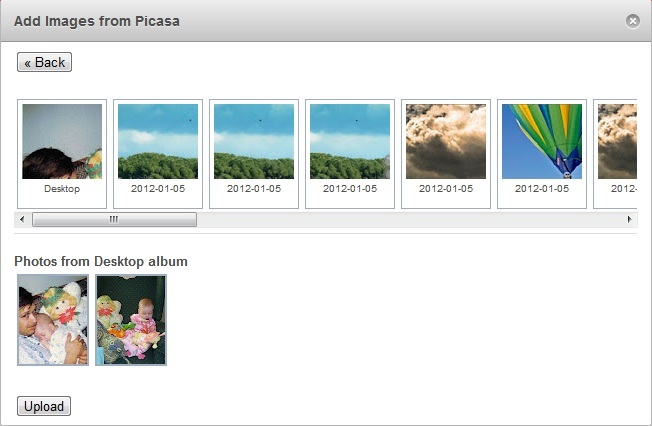 The dialog will change to show you all the albums in your Picasa account. After you select the album that contains the images you want to watermark you'll be shown a list of photos in that album. Select the photos you want to watermark and then click Upload. Select the Picasa Album and then the photos you want to watermark. After you've uploaded your photos you can watermark them like any other photos. When you're ready, click on the Save Images button. In the Download dialog, click on the Save to Picasa icon, and then select the Picasa album you want to save the photos to. Select the Picasa album to save your watermarked photos directly to Picasa. An Upload Success indicator will be shown when the images have been uploaded to Picasa.